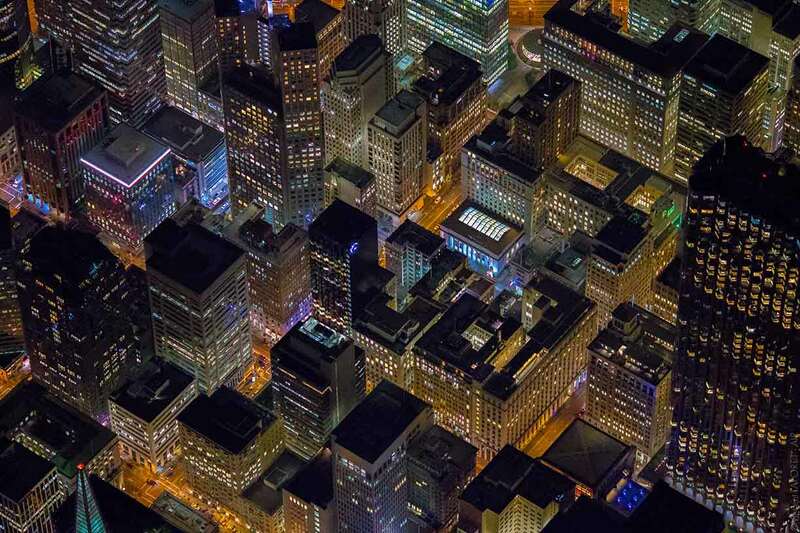 Vincent Laforet is a leading US commercial photographer with a specialty in aerial photography of cities, at night, from a helicopter. The degree of technical difficulty is high because of the low light and consequent exposure problems, plus the shaking platform up in the air. He’s a master photographer and uses the best equipment but it’s still a big thing to make pictures as pretty as these. 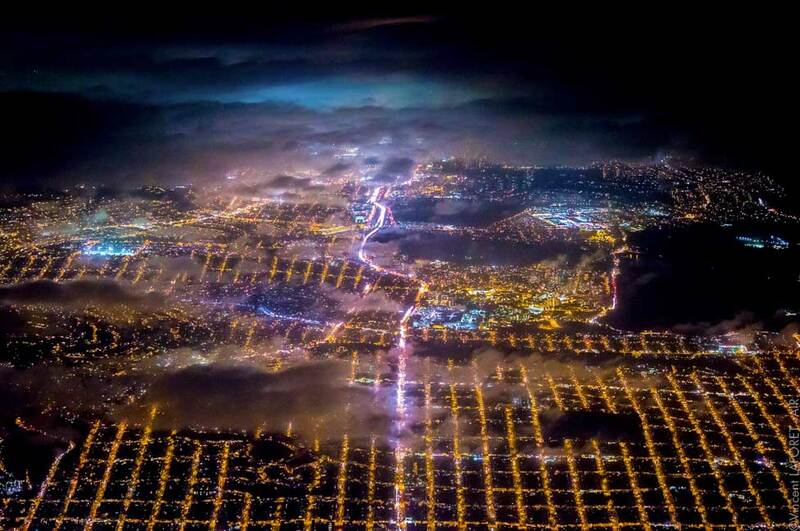 Click on this one of San Francisco to see what I mean. 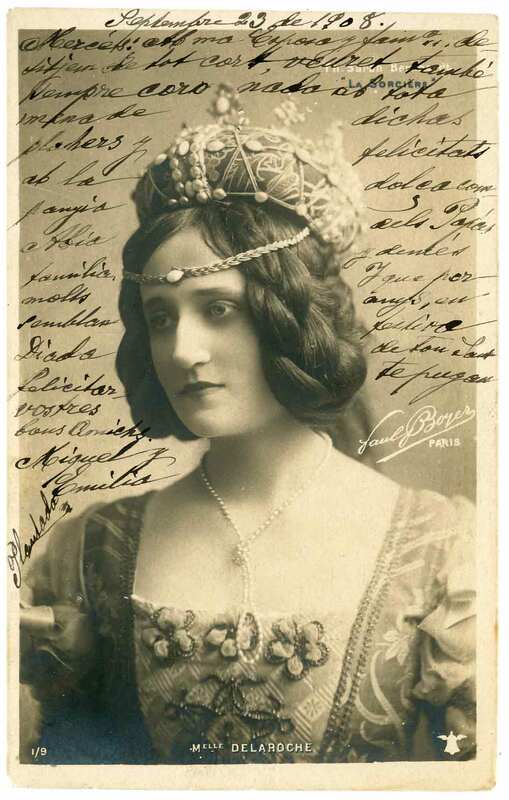 When the picture postcard industry started up in about 1900, one of the most popular genres was theatrical cards, with images of stage and music hall stars. These glamorous identities were presented in beautiful studio portraits, usually sepia-tones or hand-coloured, some even with glitter added. 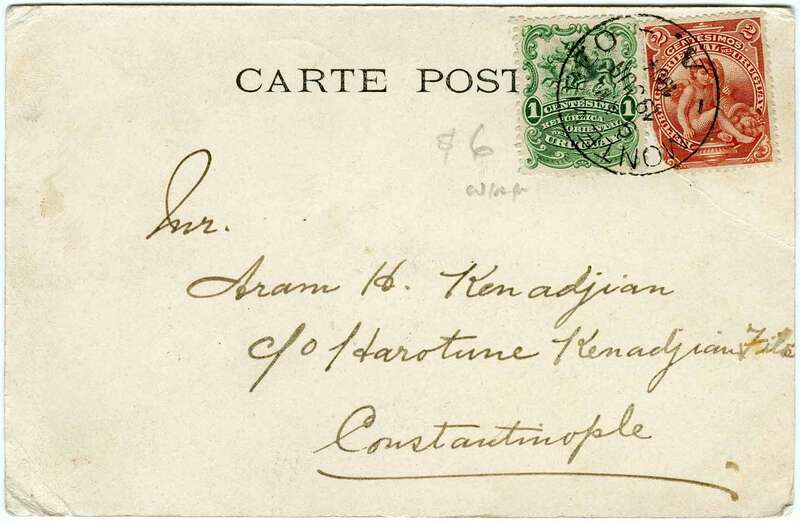 For some time, only the address was permitted on the back of these postcards so that any written message was forced on to the front. 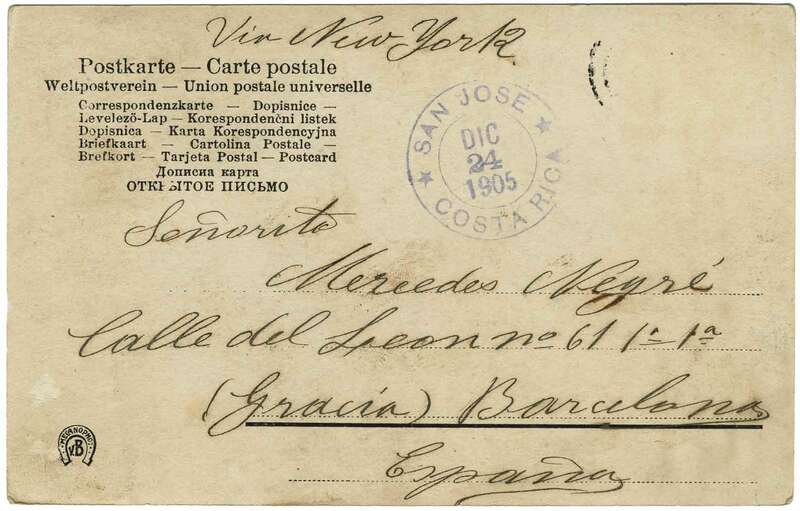 Most cards were sent or collected intact with no message, but in some cases writing over the message produced a hybrid image-text “artwork”. 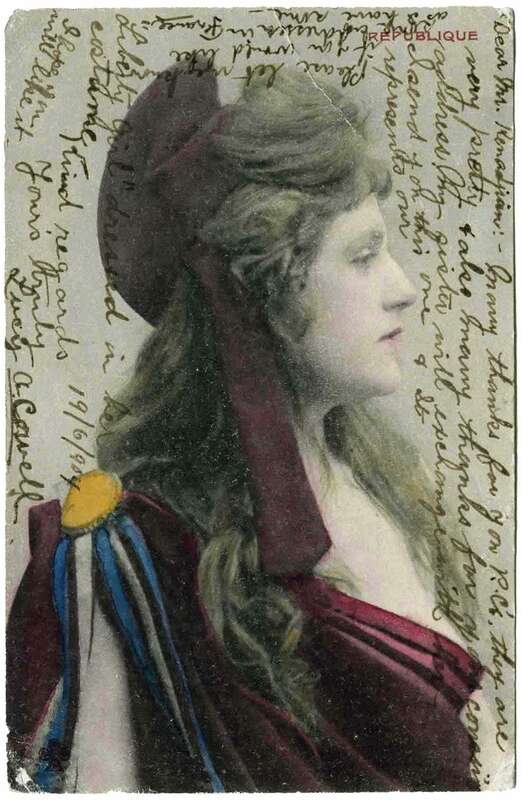 These cards would be lovely without the handwriting, but the texture of the script seems to add something to the image, a veil of words and sentiments. The cards originate from Barcelona and Constantinople, present day Istanbul, and what journey brought them here I can only imagine. The one below is the subject of a post on this blog from 2013. 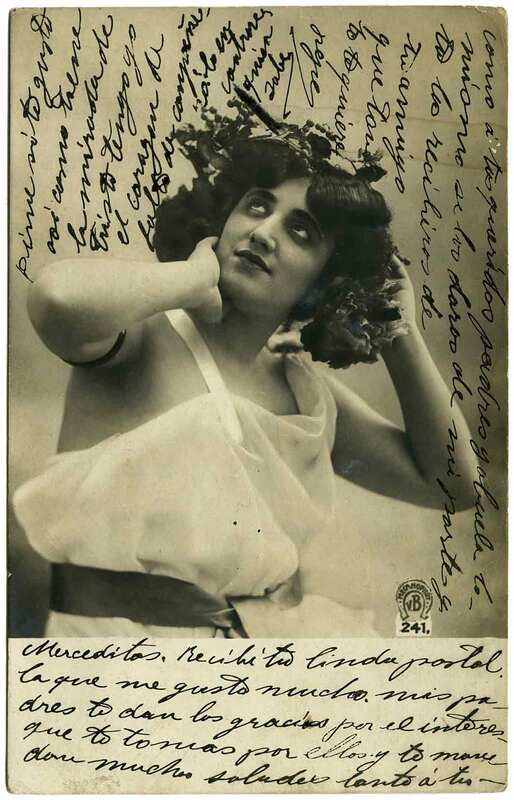 Information about this genre of historic postcards can be found at stagebeauty.net. 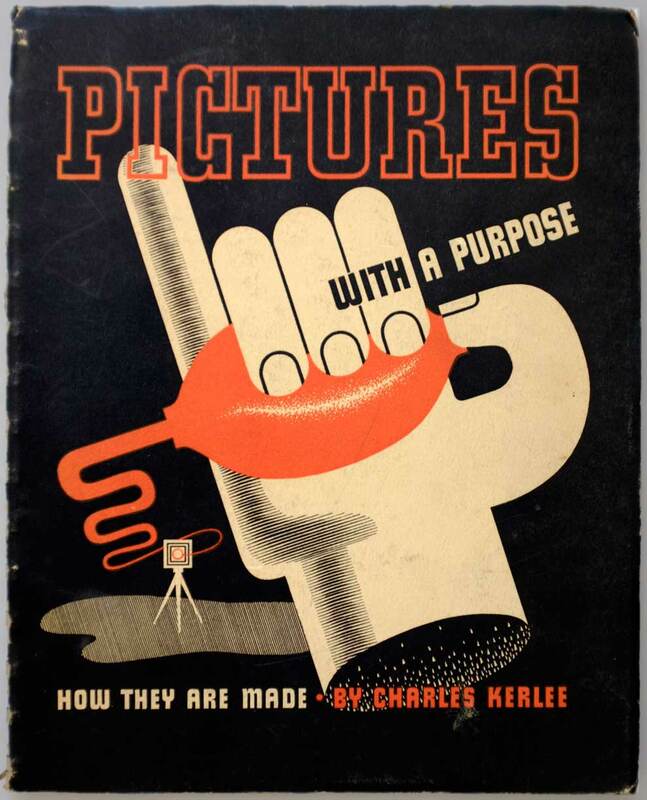 Pictures with a Purpose is a 1939 book by Charles Kerlee, an established commercial photographer in California. 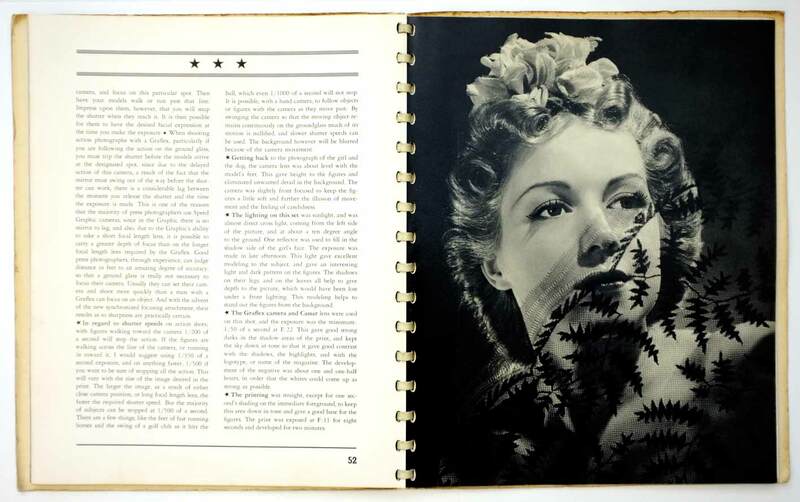 With its dramatic Art Deco cover, the book presents a range of his work in beautiful black & white printing, along with detailed stories of how each photograph was made (click on the images to read them). He explains everything. Minimum exposure was absolutely essential to give the best rendition of the delicate detail and texture. 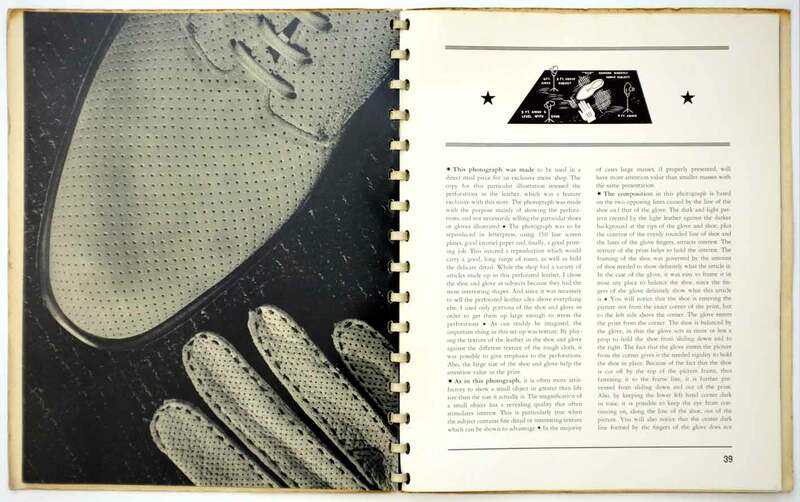 The slightest over-exposure would have caused a loss of contrast in the perforations, in that the darks in the small holes would tend to become lighter. Furthermore, over-exposure would have caused a loss of the delicate middle-tones of the suede leather. That is a seasoned professional talking. Three years after this book when the US entered World War II, the great Edward Steichen set up the Naval Aviation Photographic Unit and recruited the best photographers he could find. Kerlee was among them. 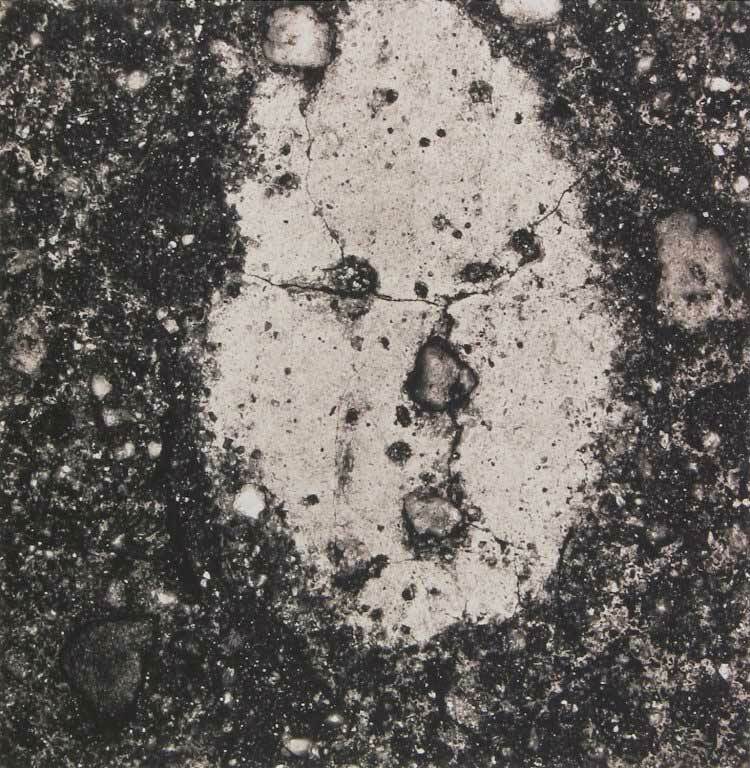 Walking the streets of Manhattan with a portable stool and a camera fitted with several extension tubes, Penn lowered his eye and his equipment nearly to the pavement. There he found a universe of abject form: pebbled concrete, discarded matches and cigarette butts, and above all a wealth of masticated gum. Irving Penn, like his contemporary Richard Avedon, was s a major figure in photography, a fashion photographer who practically defined mid-century chic, a portraitist of the most worthy celebrities and an innovative advertising photographer. He was great commercial success story for sixty years. 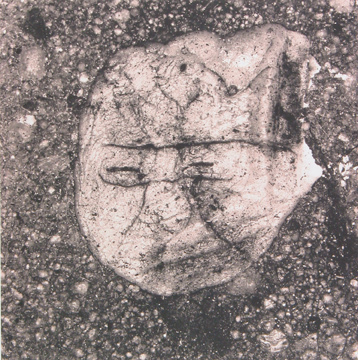 but throughout this period he was also an artist pursuing his own projects. 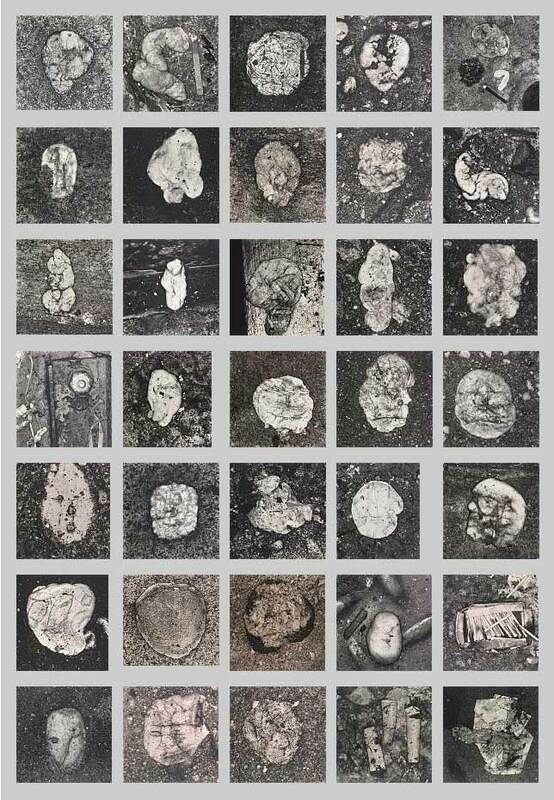 Underfoot is one such project and typical in that it embraces the lowest subject matter and raises it to a high status. 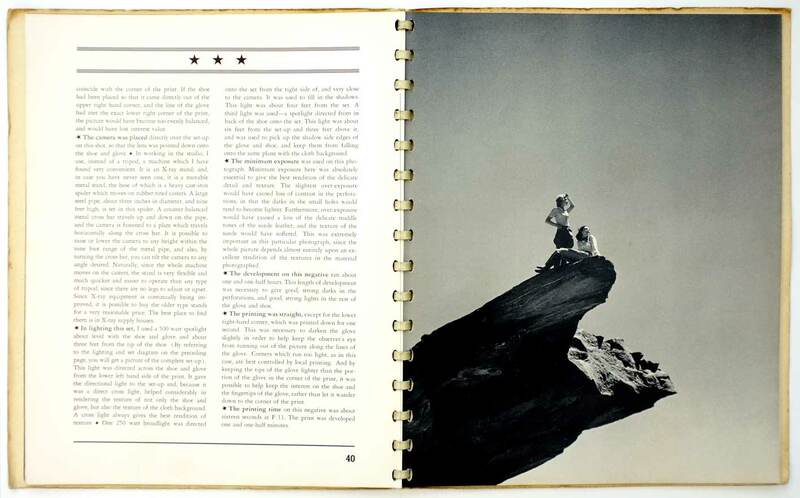 Penn used his 8×10 camera to transform detritus into monumental figures. The large gallery prints were made from the noble metal palladium, one of the most difficult and expensive print materials. Despite the ugliness of the subject matter, the prints are gorgeous examples of black & white craft. And you can imagine how a photographer who’s day job involved glamour and celebrity might, in his off-time, want to explore its opposite. The exhibition Richard Avedon People closes this weekend at the Ian Potter Museum so you’re running out of time. This is the first Avedon show in Australia. One of my students was surprised at how how involved Avedon was in progressive politics in the 1960s, a turbulent decade in the US. 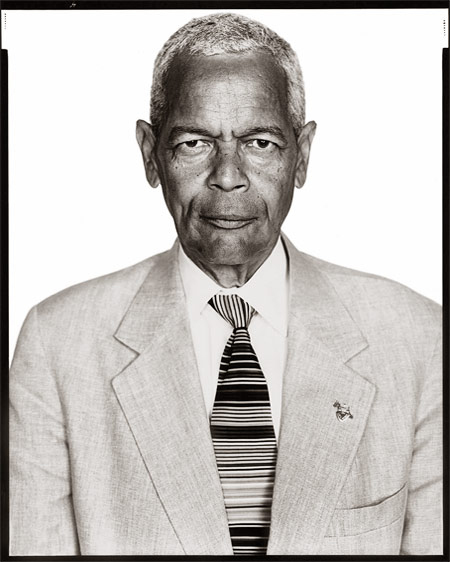 He photographed everyone on the left, including Civil Rights leader Julian Bond. This is a remarkable photograph, presenting the leader of the renowned Student Nonviolent Coordinating Committee as part of a seemingly endless and unstoppable column. He is the leader but an equal amongst his comrades. 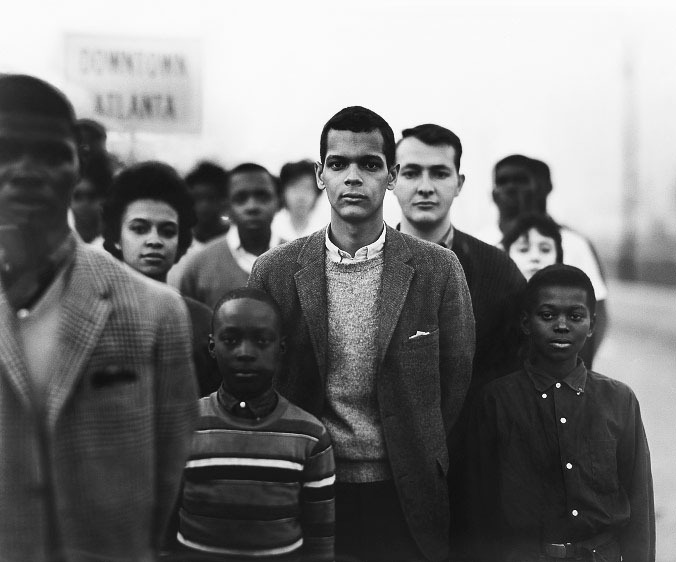 Avedon achieves this with the careful placement of individuals, male/female, young/older, light-skinned/dark-skinned. 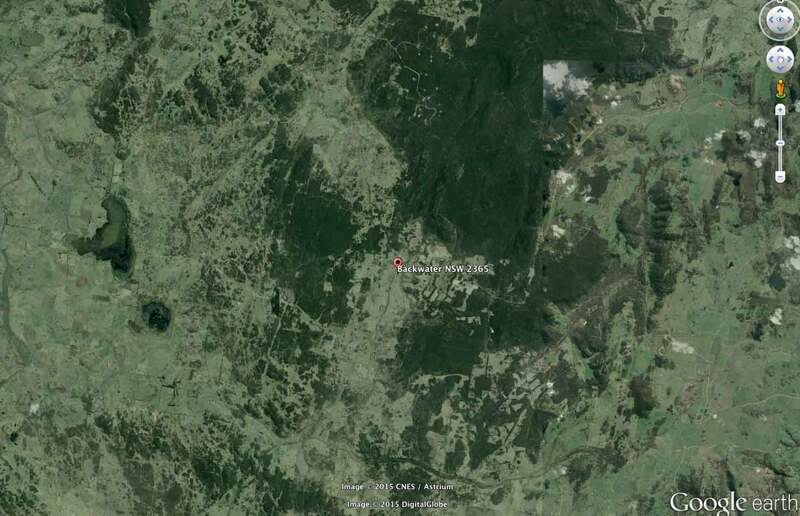 It’s a representative sample of a community. He does it also with the selective focus of the shallow depth-of-field. 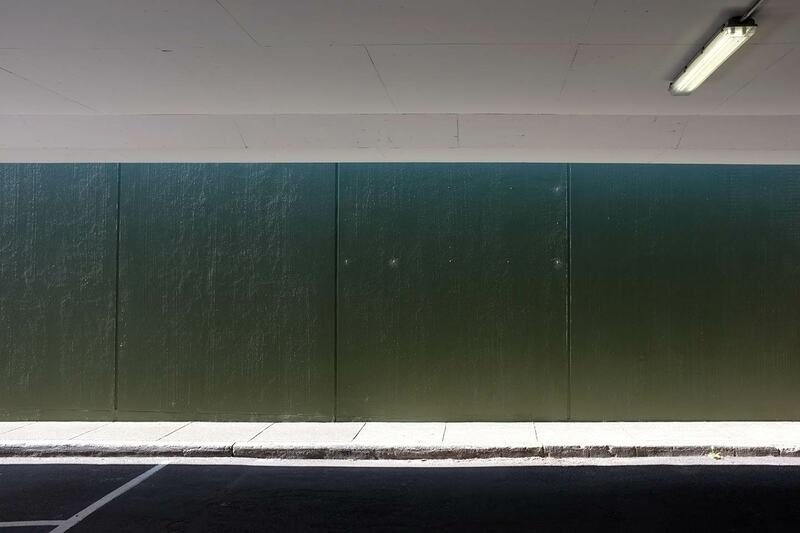 A large lens aperture progressively blurs those further away from the main figure, but enfolds them in the same tonal shape. The blur, together with their calm expressions, quietens the picture, illustrating the nonviolent part of the group’s title. There was another shot taken at the same time but it’s much less effective in making this point. In his last year, at the age of 81, Avedon photographed Bond again. Now a distinguished American with decades as a senator, Bond is in the centre of the composition and fills the frame. It’s made in Avedon’s classic formal style, the black film-edge framing and locking the subject, the one-to-one encounter giving us the full force of two remarkable people.